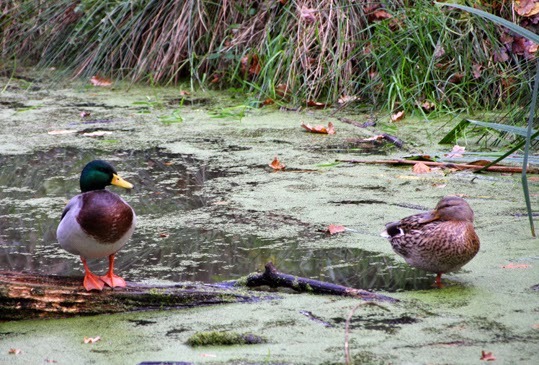 I saw this pair of ducks on a dew pond in Sydenham Hill Wood last weekend while out on a walk and took this photo. Actually, I took a pair of photos. In this one the ducks are looking towards each other in a friendly manner, but in the other one they are looking in quite the opposite direction, making it seem as though they had just had a disagreement! I think I prefer this photo. According the book Animal Spirit Guides: How to Discover Your Power Animal and the Shamanic Path, by Chris Luttichau, duck's medicine - or power - is about abundance. Ducks are obviously associated with water, which gives life and sustains growth. Ducks have a good layer of fat to keep them warm in even in the chilly winter weather. Chris Luttichau says: "Duck's close link to water is mirrored in her form. She can fly, but she doesn't soar like an eagle does... Their heavy bodies take them down into the water, where they find food at the bottom of ponds, lakes and rivers. Duck teaches us to dive into our feelings and find their life-giving nourishment." He adds that ducks can be quiet and mysterious, alone in the reeds, or they can be sociable. For those who are sometimes loners, listening to the lesson of duck can help us get out and party when the season is right.